London CND held our annual ceremony to commemorate the victims of the bombings of Hiroshima and Nagasaki on Monday 6th August. In a powerful and moving ceremony, we heard from a range of speakers and and performers, and were joined by around 100 attendees. 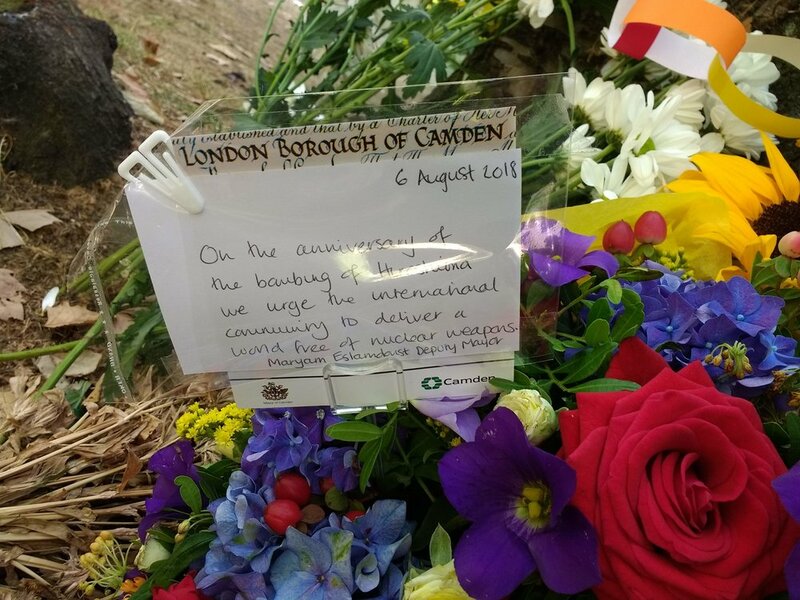 Councillor Maryam Eslamdoust, the Deputy Mayor of Camden, lay a wreath at the memorial tree, and we were sent a message from the Mayor of Tower Hamlets which you can read below, alongside the statement from the Mayor of Hiroshima which was read out by Shigeo Kobayashi at the ceremony. The 6th of August is an important point of reflection each year, where we take the time to remember the terrible events of World War 2, particularly Hiroshima and Nagasaki. This day is marked around the world as a vital moment to pause, reflect, and think about how we can all work together to avoid and agree to prevent such events in the future. This has become increasingly important in a world which can sometime feel ever more fragmented. The last century also marked an increased targeting, particularly with modern and more powerful weapons and particularly those able to strike remotely, of urban populations in war. The events of 1945 feel increasingly distant as each year passes, yet we must not forget them. They are a reminder of what can happen in the darkest of days, and a reminder that we must always strive for peace. It’s 73 years ago and a Monday morning, just like today. With the mid-summer sun already blazing, Hiroshima starts another day. Please listen to what I say next as if you and your loved ones were there. At 8:15 comes a blinding flash. A fireball more than a million degrees Celsius releases intense radiation, heat, and then, a tremendous blast. Below the roiling mushroom cloud, innocent lives are snuffed out as the city is obliterated.“I’m so hot! It’s killing me!” From under collapsed houses, children scream for their mothers. “Water! Please, water!” come moans and groans from the brink of death. In the foul stench of burning people, victims wander around like ghosts, their flesh peeled and red. Black rain fell all around. The scenes of hell burnt into their memories and the radiation eating away at their minds and bodies are even now sources of pain for hibakusha who survive. Today, with more than 14,000 nuclear warheads remaining, the likelihood is growing that what we saw in Hiroshima after the explosion that day will return, by intent or accident, plunging people into agony. The hibakusha, based on their intimate knowledge of the terror of nuclear weapons, are ringing an alarm against the temptation to possess them. Year by year, as hibakusha decrease in number, listening to them grows ever more crucial. One hibakusha who was 20 says, “If nuclear weapons are used, every living thing will be annihilated. Our beautiful Earth will be left in ruins. World leaders should gather in the A-bombed cities, encounter our tragedy, and, at a minimum, set a course toward freedom from nuclear weapons. I want human beings to become good stewards of creation capable of abolishing nuclear weapons.” He asks world leaders to focus their reason and insight on abolishing nuclear weapons so we can treasure life and avoid destroying the Earth. Last year, the Nobel Peace Prize went to ICAN, an organization that contributed to the formation of the Treaty on the Prohibition of Nuclear Weapons. Thus, the spirit of the hibakusha is spreading through the world. On the other hand, certain countries are blatantly proclaiming self-centered nationalism and modernizing their nuclear arsenals, rekindling tensions that had eased with the end of the Cold War. Another hibakusha who was 20 makes this appeal: “I hope no such tragedy ever happens again. We must never allow ours to fade into the forgotten past. I hope from the bottom of my heart that humanity will apply our wisdom to making our entire Earth peaceful.” If the human family forgets history or stops confronting it, we could again commit a terrible error. That is precisely why we must continue talking about Hiroshima. Efforts to eliminate nuclear weapons must continue based on intelligent actions by leaders around the world. Nuclear deterrence and nuclear umbrellas flaunt the destructive power of nuclear weapons and seek to maintain international order by generating fear in rival countries. This approach to guaranteeing long-term security is inherently unstable and extremely dangerous. World leaders must have this reality etched in their hearts as they negotiate in good faith the elimination of nuclear arsenals, which is a legal obligation under the Nuclear Non-Proliferation Treaty. Furthermore, they must strive to make the Treaty on the Prohibition of Nuclear Weapons a milestone along the path to a nuclear-weapon-free world. We in civil society fervently hope that the easing of tensions on the Korean Peninsula will proceed through peaceable dialogue. For leaders to take courageous actions, civil society must respect diversity, build mutual trust, and make the abolition of nuclear weapons a value shared by all humankind. Mayors for Peace, now with more than 7,600 member cities around the world, will focus on creating that environment. I ask the Japanese government to manifest the magnificent pacifism of the Japanese Constitution in the movement toward the entry into force of the Treaty on the Prohibition of Nuclear Weapons by playing its proper role, leading the international community toward dialogue and cooperation for a world without nuclear weapons. In addition, I hereby demand an expansion of the black rain areas along with greater concern and improved assistance for the many people suffering the mental and physical effects of radiation, especially the hibakusha, whose average age is now over 82. Today, we renew our commitment and offer sincere consolation to the souls of all A-bomb victims. Along with Nagasaki, the other A-bombed city, and with much of the world’s population, Hiroshima pledges to do everything in our power to achieve lasting world peace and the abolition of nuclear weapons. You can view more photos from the ceremony here.